Already well under construction, Firebirds Wood Fired Grill will bring its first Oklahoma location to Chisholm Creek later this year. 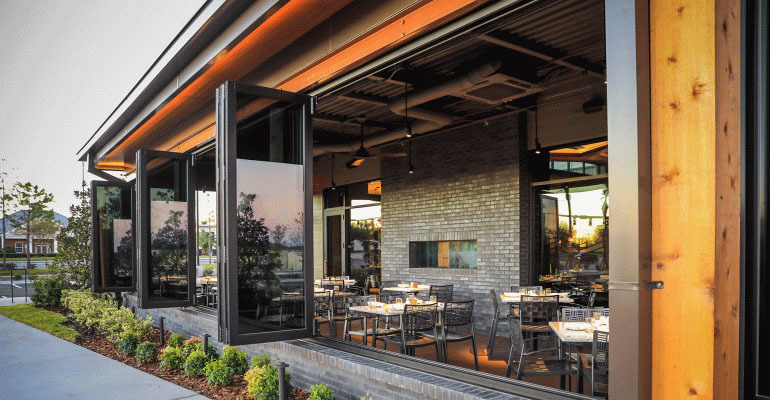 Operating almost 50 locations in 19 states, the Charlotte-based company is building a 7,325 square foot reastaurant on the lake at The Pointe at Chisholm Creek. 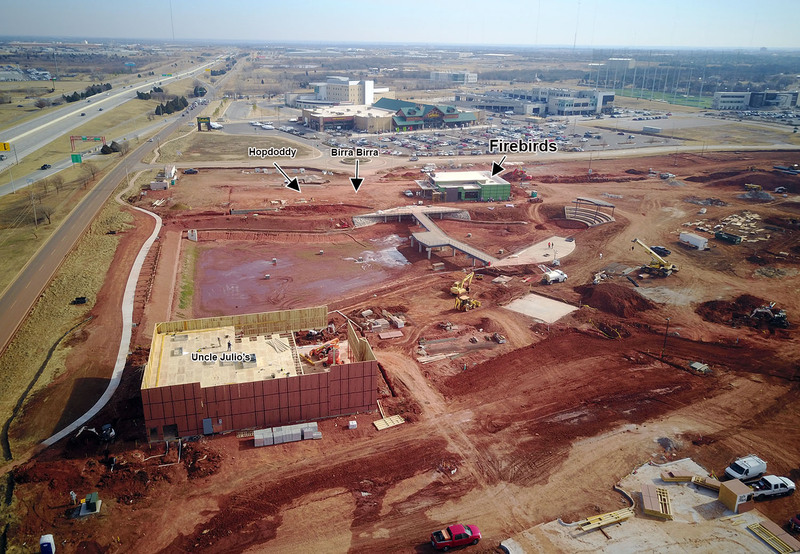 OKCTalk had previously reported the state's first Uncle Julio's will be part of the same development, as will be Hopdoddy and Birra Birra, a new Italian concept by the purveyors of Hatch, Sidecar and Broadway 10. 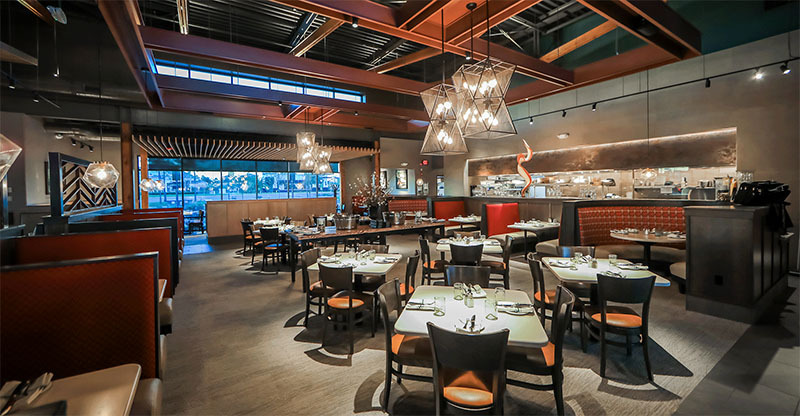 Firebirds has a heavy emphasis on fire-grilled items such as steaks and seafood and other American classics. The Oklahoma City location will feature a large patio facing the lake, and open main dining area with vaulted ceilings and FIREBAR with craft beer, private label wine and artisan cocktails. Construction is by Smith & Pickle and Beck Designs is the architect. 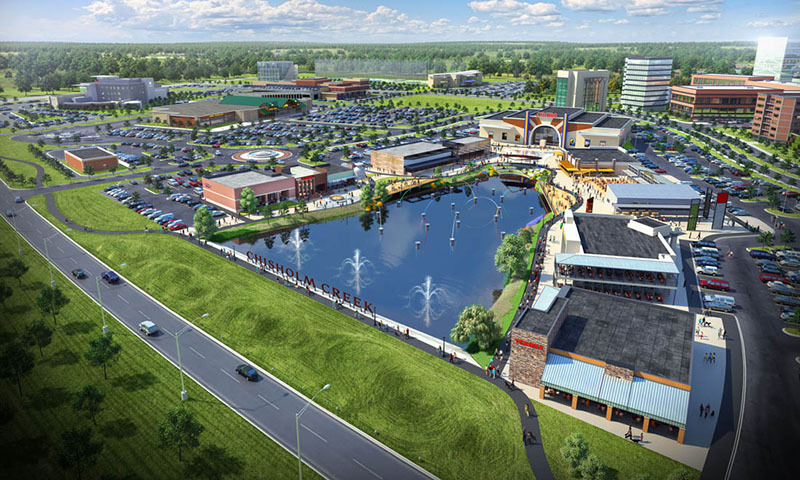 Chisholm Creek – a massive mixed-use project between Penn and Western just south of Memorial Road – is already host to Top Golf, Cabela's, iFly and in Tract 30 RePUBlic, Fuzzy's Taco, Yokozuna, Sidecar and soon Hatch will be opening its second location. At the far western edge of the development, Torchy's Tacos, Potbelly Sandwiches and Starbucks recently opened. In addition, Argon apartments opened last year. Awesome! Chisholm Creek is really turning out much better than I expected. I had forgotten about Firebirds. I ate there pretty regularly when I lived in Charlotte. It's not mindblowing but it's a decent choice for upscale/casual dining. Their new concept is really nice and the lake setting should be great. I feel like you just described most of Hal Smith's restaurants lol. 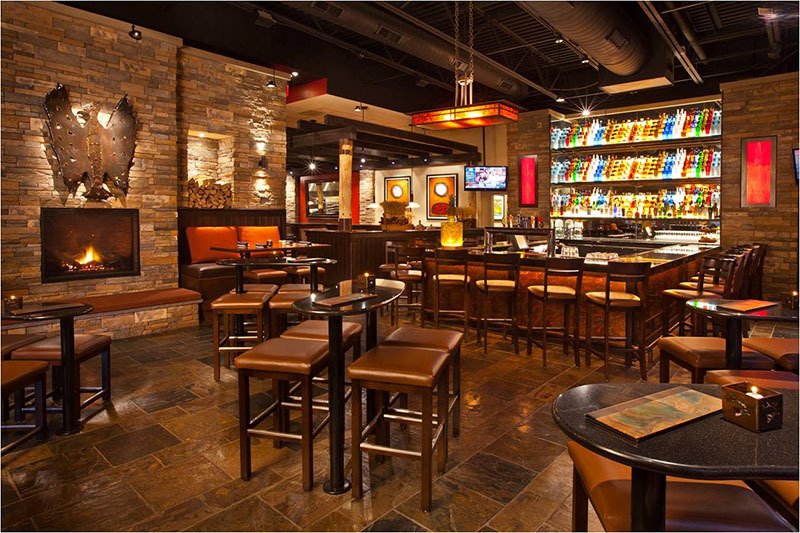 I ate at Firebirds in Nashville for a business dinner, and I really enjoyed it. Was hoping Oklahoma City would eventually get one. It’s a win in my book! This seems a lot like Red Rock. Wonder if there will be a mass migration of Cougars on Thursday nights in the near future. The have Cabela's, Top Golf, iFly, Scissors & Scotch, BancFirst, Jerky.com, a nail salon, a spa, blo Beauty Bar, Haus de Lux and several office tenants. Plenty more retail to follow. I agree with this completely. When Chisholm Creek was announced I was expecting more of a mix but so far it's been almost entirely eating/drinking establishments. While there are a few locals, I am surprised that there hasn't been more new-to-market national retailers interested in Chisholm Creek or downtown for that matter. If you haven't noticed, most retail is struggling. Plus, note the places I listed as already signed up. I can only hope that it'll turn out a bit better than that. Pete. I'm certainly not down on Chisholm Creek. Please don't misunderstand. I drove through there when I was home for my high school reunion in October and was impressed. I agree that the businesses you mentioned do represent a variety of things, but with respect, nail and beauty salons and banks are not what I would consider huge draws for casual "let's roam around for an hour or two in the sunshine and then get a drink" shoppers, which is what I think Chisholm Creek is going for. I do realize that we are extremely early in the development, and since restaurants are larger operations with larger budgets they can take more risk. I also would say Top Golf and IFly represent home runs! And maybe this is all OK. Actually there's a point to be made that mixed use can mean lots of things. I just hope that as it continues to build, it evolves into the type of place where someone can park a car and meander around for a while. My biggest concern with all the chains moving in is that eventually the restaurant bubble has to burst. So many new places in the last few years. I just hope when it does that the locally owned groups and individuals survive it because they have really been going above and beyond on a lot of their concepts recently. People are always going to eat out so the good will survive. I don't think it's a matter of a bubble bursting, more that the strong will thrive and those who aren't good or don't know how to run a business will fall away. IMO, this is generally a healthy thing. For the longest time, there was such pent-up demand in OKC that almost anything new and decent did well. Not the case any more... The bar is being raised. As far as salons and banks at Tract 30, remember they have multiple levels and much was not designed for walk-in retail. The strong will survive but that doesn't guarantee the good will..... Seen it happen too many times. Is Chisholm Creek the hottest development area in the Metro? I'm with you. Chisholm Creek is a great development. But I do wish there were more retail. And that has long been the knock against Bricktown. Lots of places to eat but not much to do after you're done eating. And I do think Pete brings up a valid point that retail is struggling everywhere. But Amazon has only been killing brick and mortar retail for 5-7 years. Bricktown could've gotten more retail in there long before that. To be fair, they haven't even began working on any of the predominantly retail buildings. That is in a later phase. I think it was as recent as the early 2000s that chains like Outback Steakhouse and Red Lobster were voted as the best restaurants in OKC in the Gazette. That is mindnumbing for a city this size. It goes to show how far the city has come and also how much demand there was for better. Not sure where you're coming up with that info. We've definitely grown recently in the restaurant department, but there were still high quality options 15-20 years ago. Dang! I did not know that info like this was available! Good find. You're right. I'm thinking the '90s, which were like I described. By the 2000s there were a lot more quality options. I get a kick out of Howard Schnellenberger being named the "Best Newcomer" in 1995.